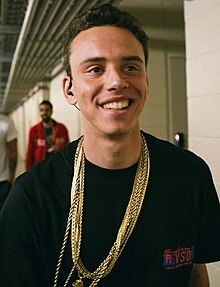 Sir Robert Bryson Hall II[lower-alpha 1] (born Januar 22, 1990), kent bi his stage name Logic, is an American rapper, sangster, sangwriter, an record producer. ↑ "Sir" is pairt o his name, not an honorific title. ↑ "Logic Announces "Elysium" Label". Retrieved June 30, 2017. ↑ "My Father". Retrieved July 4, 2014. my Mother threw a "Sir" in the beginning Offeecial wabsteid . ↑ Case, Wesley (June 21, 2013). "Logic: From Gaithersburg to Def Jam and Hollywood". Baltimore Sun. Retrieved August 9, 2013. This page wis last eeditit on 31 Julie 2018, at 19:22.